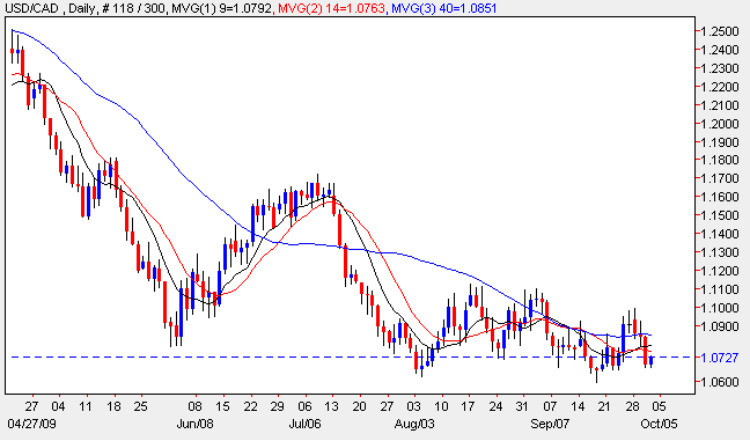 The usd vs cad pair continued to test the recently formed support level at 1.065 once again yesterday, ending the trading session with a wide spread down bar, which breached both the 9 day and 14 day moving averages, and validating the tweezer top of the last few days. With continued US dollar weakness now almost a ‘given’, it seems that it will only be a matter of time before this level is broken with a much deeper move lower to retest support in the 1.05 region, followed by a move lower to 1.03 and parity in due course. Friday’s Non Farm Payroll data may well provide the momentum to break through the current level, particularly if these figures follow the pattern set by yesterday’s ADP numbers which were worse than expected, suggesting that the NFP numbers may follow suit. If so then the US dollar will be condemned to a further period of ultra low rates, and therefore remain the preserve of the carry trade as the low yielding currency of the trade, a role once hel by the Japanese yen. With no fundamental news on the economic calendar for Canada, the focus today for the usd vs cad will be on the US markets where we have no less than eleven news items scheduled for release, with the ‘red flag’ items being the testimony from FED Chairman Bernanke, which is followed shortly afterwards by the ISM Manufacturing data and Pending Home Sales, and pre-ceded by the weekly Unemployment Claims and Core PCE Price Index. The unemployment claims may also give a clue to Friday’s data so these will be watched with particular interest.